A row of Bramble Jelly Shots, a la Toby Cecchini, beckons . . . I have been dying to have a go at the Bramble Jelly Shot recipe since it first appeared on the NYT blogs in March of this year! A Bramble cocktail is quite divine - a lemon sour base, gin, and a float of blackberry liqueur. 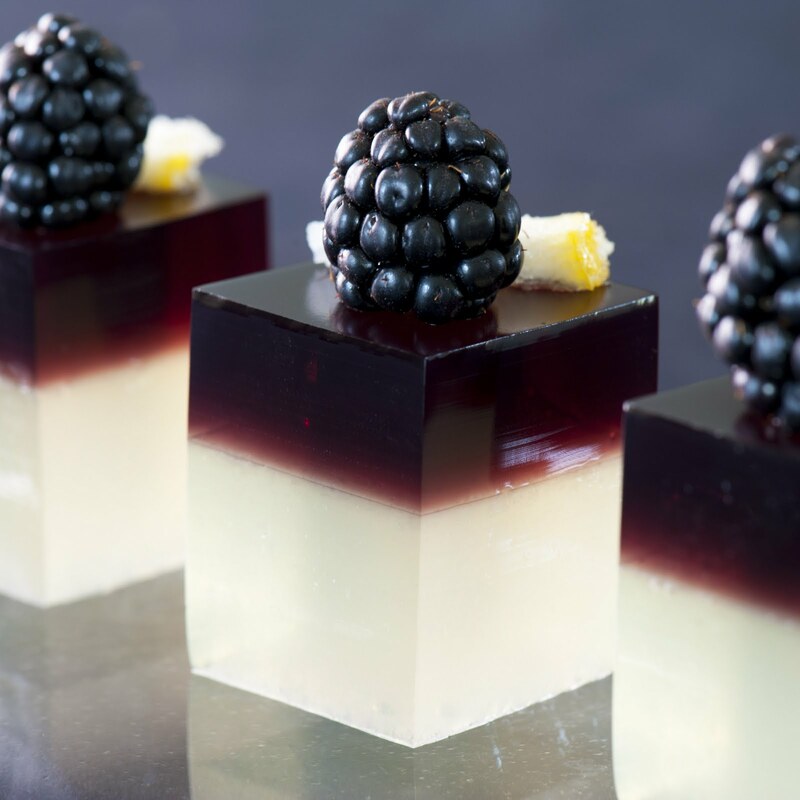 The Bramble's translation to gelatin was conducted by noted cocktail expert/bartender/author Toby Cecchini, who also wrote the NYT piece. Take a minute to read the article if you can - its a tremendously fun read, not only because JSTK is mentioned in the article - Toby's trials and tribulations in Jelly Shot Land are very entertaining! Well, Bramble Jelly Shot was certainly worth the wait. It's a wonderful recipe, tasty and gorgeous, with a handsome, well thought out garnish! I tested the Bramble recipe first with gin, as indicated Toby's instructions, but made a vodka version as well, per the preference of one of the tasting groups. The gin version was a bit more complex, but the vodka was extremely tasty too - both were gobbled up in short order! Nice work, Toby - you are welcome at the Test Kitchen anytime!!! Hope you enjoy! The recipe for Bramble Jelly Shots follows, and is also on the NYT article link. Juice enough lemons to give you 2/3 cup juice, keeping the hulls as you squeeze. Roughly chop the squeezed hulls and put them in a coverable container along with the gin and the lemon juice. Leave at room temperature for at least 2 hours. It’s a good idea to do this before starting the float, so that by the time that has firmed up, your infusion is ready to go. When the float layer is firm, bloom the gelatin in the hot water by sprinkling it slowly while stirring, and continuing stirring until fully dissolved. Add the sugar and stir until that is also fully dissolved. Strain the gin mixture off from the lemon hulls through a fine sieve or chinoise and add it into the gelatin mixture, stirring well. Over a spoon, so as not to gouge a divot in the float layer, pour the lemon sour mix onto the float layer and return to refrigerator, again checking for levelness. Chill overnight. When ready to serve, cut into squares, or use a cookie cutter for shapes, and pull up carefully, using a cake spatula to get under the float layer. Garnish with a blackberry and/or a thin wedge of candied lemon. Or simply slurp.